It's Good to Know What's Coming. One day,your heroes may face a heavily mechanized patrol of Coalition Soldiers. The next, they're trading lasers and mystic bolts with a horde of cybenetic-loving demons called Brodkil. Next week, a gargantuan tentacled horror from a Rift threatens every living thing in the region, and it's up to the Tomorrow Legion to stop it... somehow. 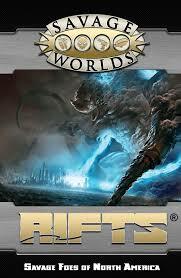 Rifts: Savage Foes of North America contains stats and descriptions for all of the major monsters and enemies a group of heroes might face as they serve in the Tomorrow Legion: the Coalition States, the Federation of Magic, the Black Market, the 1st Apocalyptic Cavalry, the bandits of the Pecos Empire, and much, much more. Important key figures, such as Emperor Prosek, Lord Alistair Dunscon, and Sabre Lasar are included. For those times when a Rift opens and you want to randomly figure out what come out of it, there's an extensive Creatures from the Rifts Generator to help you.